Andrew Thompson finds the perfect unit for his Earth Moving company - FloodRite™ with Loading Legs! Free Call - Call us Today! Andrew Thompson from Thompson Brothers Earthmoving in Balliang - Victoria, says, "We choose the TTi FloodRite tank for it's versatility to be able to slide in and out of he tip truck and as far as the quickness and ease of operation." He says, "We also wanted to be able to not have a dedicated water truck as such. I say the versatility to have our tip truck when needed and a water cart - and this water, it's a perfect build because of it's versatility with the magnum sprayers - Center, Left and Right. The pump has got the capacity to run all 3 at once and of course we use that for dust suppression, clay compaction; and of course the pressurised dribble bar for crushed rock placement.... Has been fantastic and works really well for that!" "Overall it's been a fantastic unit! It's very easy to slide in and out of the tip truck safely and satisfactorily." Andrew went on to explain how, "The remote control feature is wireless - with no pipes and wires which has been fantastic in that respect too!" "So I would thoroughly recommend the FloodRite to anybody!" I’m glad I decided to buy with TTi! Great product, and hassle free service. I recently purchased a TTi Fire Attack trailer and used it for tree watering. Love it, great product! We bought a TTi water cartage tank to use as a prototype. We’re very happy with the tank. My client bought the TTi Fire Attack unit and is very happy with it. It’s ready to be lowered onto his Hilux if there’s ever a fire. I bought the Fire Patrol trailer after receiving a great deal of enquiries for it last year. I like how it’s off-road but can be made registrable. Thank you Kevin and the team that got my Sprayer delivered to me in Darwin, great service and most happy with the product. Cheers! Free Call, Call Us Today To Find Out More! Helpful Links, Check it out! Trans Tank® International (TTi) is based in the town of Nathalia, a 35 minute drive northwest of the regional city of Shepparton in Victoria, where we have been manufacturing rotationally moulded polyethylene tanks for nearly 16 years. Operating formerly under the trading name Rapid Spray Southern, our tanks are a staple in both the agricultural and industrial marketplace. Many thanks Ross. What fantastic service you have provided. You’ve gone above and beyond. My TTi spray trailer is exceptionally well designed and constructed. 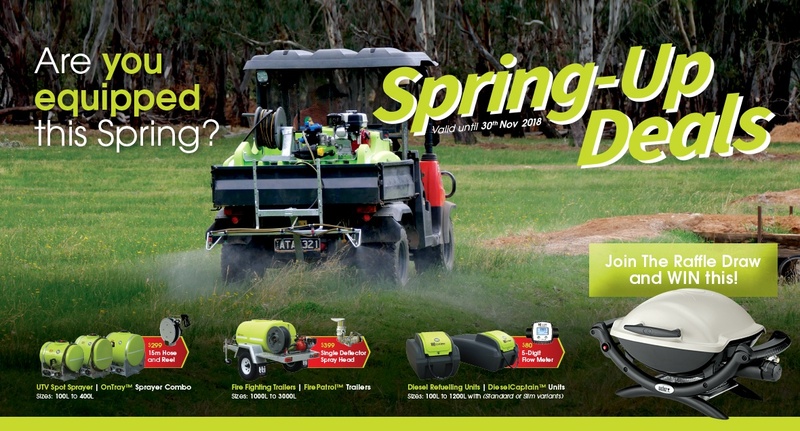 I can do my spraying effectively and efficiently!